Joan of Arc is an emblem: a saint of the Roman Catholic Church, the inspiration of so many novels and films and George Bernard Shaw’s iconic play Saint Joan. 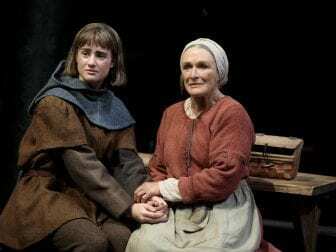 Glenn Close plays Isabelle (right), the mother of Joan of Arc (left, played by Grace van Patten), in the play Mother of the Maid. Glenn Close plays Joan of Arc’s mother, Isabelle — a strong, steely, loving woman — in Jane Anderson’s new play, Mother of the Maid, now at New York’s Public Theater through Dec. 23. The show also stars Grace van Patten (as Joan) and Dermot Crowley (as Joan’s father). She (and her dog) spoke with NPR about playing mom to a teen visionary. Her mother actually testified in front of the pope. And the last line of the play, “I had a daughter once,” was from one of the things that Isabelle Arc said. Anyway, I can go on and on ’cause I did a lot of reading about it. There’s a wonderful book called The Waning of the Middle Ages that brilliantly describes what darkness was like, what sounds were like, the fact that with much fewer social strictures, people had more child-like reactions to things. You know, it’s fascinating. That’s another reason why I wanted to do this play, because I think in the world today there are a lot of mothers who can’t protect their children. And I think as a parent, it’s the most agonizing thing you can go through. Yes, and I think that the fascinating thing about Joan that you read from people who grew up with her [is] that she was an exceptional child. And the thing that I loved about all the firsthand accounts was how often they used the word “gladly.” She gladly worked in the field, she gladly went to confession, she gladly helped her mother weave. So that to me means there is somebody who had a life force, who had a positive — who looked out on the world positively. But I think her mother — lived to be 80. She went and pled her daughter’s case in front of the pope. That’s an exceptional woman too. You don’t — a peasant, uneducated … she taught herself how to read … So that is an exceptional woman. And so somewhere in Joan was aspects of her mother, yes. We have backstage here a wonderful green room with three big sofas. And he just — he knows the drill. He knows by the sound of the applause coming over the system that it’s intermission, and he’ll come and wait at the door. So sweet! And he just brings so much happiness into the building. Absolutely. The game for me is honing my craft even more. And it’s joyous for me, and it’s problematic — you have to solve a lot of problems of timing, of diction, of movement, of thought. That if you aren’t clear in a thought, the audience isn’t going to be clear on a thought. It’s immediate, of the moment. It’s creating a community in real time that’s experiencing the same thing. And it can be electric. And I think in a world where we’re getting more and more inured to whatever is stimulating or not stimulating us, to go into a room and be told a story, and to be able to react on a human level, altogether is a very comforting and powerful thing.